It does seem like everything comes at once, doesn't it? She will appreciate your prayers as do I. Thanks, JSM. Just talked to JSM. Still waiting for the surgeon to come in and give her a shot to deaden her lip. She thanked everyone for their prayers. She sounded like she had a mouth full of cotton. You know JSM she is more worried about the dog. She said they would do the surgery tomorrow morning. Mouth full of cotton. When you have 1/2 a missing lip, the hardest thing to say is "I need pain medicine" and "the beeper is going off" over the intercom. I was surprised how well I understood you. You are a trooper, JSM! So sorry to hear about JSM being bitten. Please send my condolences and best wishes. Hope she is not in pain and gets all fixed up soon. Thanks Brandi, getting better slowly but surely. I was surprised that it was not bleeding worse than it was. I expected to see a tourniquet on your neck or at least CC's hands around your throat. JSM had her reconstruction surgery on her lip about 1 Texas time. Haven't heard how it went. But will let you know when I hear anything. So sorry it's 1 this afternoon. Not this morning. Been a long day. Wish it had been 1 am, I slammed 5 diet cokes between 11pm to 2 am, couldn't sleep a wink Saturday night. I had the worst headache, thank goodness I had my rosary beads, prayed it about 10 times through out the night because that kept my mind off my headache. Plus I had sweet Bearly checking on me late at night. I feel bad because I kept her and GE up all night. ...and we all know how much I hate to be up late at night. So sorry to hear this..knowing how much she loves heelers. Will keep her in my prayers. Thank you 4 Donks, I do love heelers and this dog loves me, just a freak accident. I didn't realize it was a dog bite, I thought when he jumped up to kiss me his big hard head hit me on the chin (big bruise there) and I bit my lip myself. How did you figure out what happened? Did they all start yelling? I still could not figure it out from what you told me, you kept saying he bumped into your chin. How did she get the bite? She bent down to kiss a neighbors red heeler and it took off half her lower lip. Friendly dog too. She feels bad for the dog causeshe doesn't want anything to happen to him. Depending upon results from surgery may need some reconstructive work done down the line. I wouldn't let him golf, he was going to play with MY new clubs. Bring out the new weapons, JSM. I never saw a thing. I didn't notice anything wrong with her ears, CC. Just kidding, JSM, you have beautiful ears. I think it's time the dogs started working on CC, just a little here, a little there. I don't know, Klaas, after that remark, I think there is a good possibility of a freeze in Texas, if only in just one area. It is an awesome job. I can't believe there was no plastic surgeon on anywhere that night. Cookie at the time, it didn't even hurt. Once I got to the hospital, still no pain, once they started messing with it OUCHIE!!!!! Hurting pretty badly right now. Throbbing more than hurting. I have heard, that when something is acute and so incredibly painful and your body cannot tolerate it, your mind turns the pain off in some way, either by making you faint or making it numb. I do not know this to be true, I have just heard it about things like the end of labor in some cases that are unusual, and some other situations. They would have had to use staples! Well....um.....just have to know, which end did you put the lipstick on? Oh my, one of my biggest fears. They are in my prayers. What can I send? When? How is everything going? You and your family are always in my prayers. I am glad to see CC has moved up one in your signature line. I hope the street is fixed soon. I wish I lived closer. I guess tuna doesn't travel well in the mail. You are in my prayers, 4D! Hope you are feeling better with each passing day. Thank you Brandi. That means a lot to me. Still in a lot of pain, swelling has gone down a bunch. I hope the doctor says once the stitches are out, it will stop hurting. The more I move around, the more it hurts. 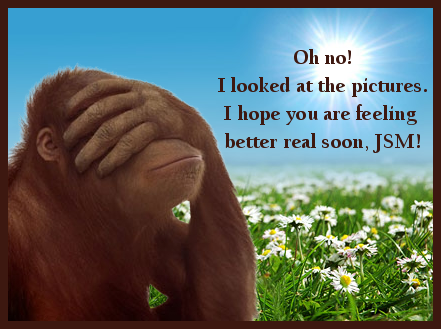 Oh, dear, JSM, I am praying for a step up in the recovery process, the suffering has gone on long enough. Hang in there, Cutie! you don't have to pucker back. It will be okay in no time, I hope. I never sent you that relic card, my Mom needed to be rushed to the hospital and I am her favorite rusher. Everything went out the window including my mind. She wouldn't let the ambulance take her, only me and I had to convince her to go right away. She is so stubborn! 4D, your Donks have nothing on this woman! I will find someone to get the pictures. Her whole journey is on facebook and the coordinator is going to make a video about the transport. Hold on to you hats . . . it will come. She is just sniffing around -- she is beautiful! Thank you God for giving me something to smile about! Cheers and tears for you and Belle, Sister! Page created in 2.161 seconds with 19 queries.